China plans to spend more than $1 billion to turn the port in Gwadar on Pakistan’s western edge into a hub of its proposed China Pakistan Economic Corridor (CPEC). 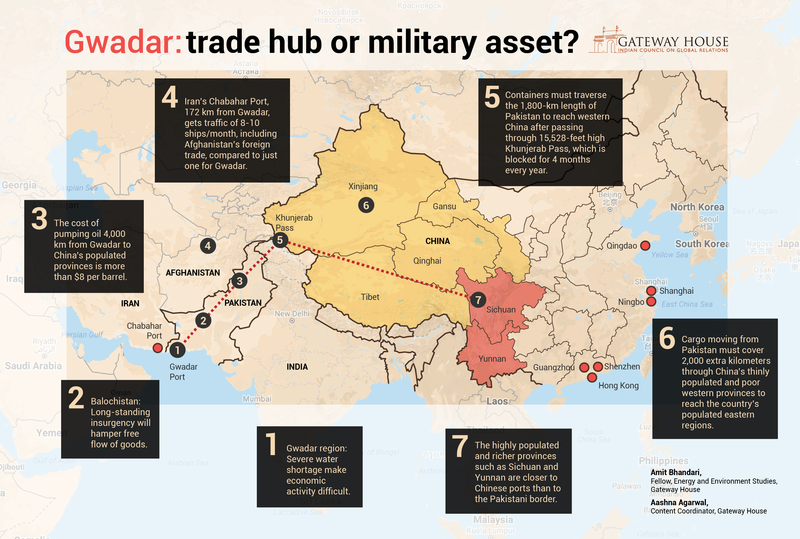 But the investment appears economically unviable – and that raises the possibility its real purpose could be to advance China’s military interests. Pakistan says the port will provide maritime connectivity to western China, to landlocked Afghanistan and other central Asian republics. Gwadar will provide alternative shipping routes for the Chinese. Pakistan also touts Gwadar as a way to allow Chinese trade with West Asia to bypass the Malacca straits chokepoint. These arguments are debatable for several reasons. First, the Gwadar region faces severe water shortages making economic activity difficult. It received just 11.1 mm of total rainfall in 2017: drinking water supplies had to be shipped to Gwadar on a naval tanker on one occasion. Second, a long-standing insurgency directed against the Pakistani military in Balochistan province makes it risky to move goods in the surrounding region. Third, Gwadar is not suitable as a base for moving oil and other goods to and from China. The cheapest mode of on-land oil transport between Gwadar and China is an oil pipeline. A similar long-distance pipeline, the Baku-Tblisi-Ceyhan (BTC) pipeline, moves more than 1 million barrels a day over 1,800 km at a cost of about $4/barrel. The distance from Gwadar to Chinese provinces that have a significant population is more than twice the length of the BTC pipeline and covers difficult terrain. Pumping crude oil across this distance via a pipeline will cost more than $8/barrel. Fourth, Pakistan has blocked land border crossings into Afghanistan, leading that country to use the Chabahar Port in Iran, 172 km from Gwadar, for its foreign trade. Chabahar currently handles eight or ten ships per month, Gwadar receives one per month. Thus, some of the proposed markets for Gwadar have already moved elsewhere. Fifth, the Khunjerab Pass, connecting northern Pakistan with western China, has an elevation of 4733 m, and is blocked four months a year, making it an unreliable and seasonal link. Sixth, Xinjiang and the three states bordering it – Gansu, Qinghai and Tibet – are the most thinly populated and least prosperous regions of China. They represent 4.2% of the Chinese population, 2.71% of China’s GDP and 42% of the country’s land mass. 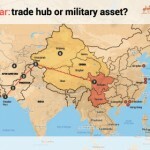 Any cargo movement between China and Pakistan will have to cover an additional 2,000 km to cross this region to more populated ones, such as Sichuan and Yunnan. Sichuan and Yunnan, which are also among the richer provinces, are closer to the eastern ports of China, such as Shanghai, Shenzhen, Ningbo, Hong Kong, Qingdao and Guangzhou, than to the Pakistani border. Any traffic from Gwadar will have to travel the 1,800-km length of Pakistan, through the Khunjerab Pass and a further 2,000 km to Sichuan and Yunnan, a distance that can only add to transportation costs. The high logistical costs of moving goods to and from China’s main economic centres raise doubts about whether the Gwadar port development strategy will resolve the ‘Malacca dilemma’. Gwadar is about 600 km from the Straits of Hormuz, and sits astride the busiest oil shipping lanes of the world, which carry 65% of India’s oil imports. These considerations, combined with the port’s proximity to India, raise suspicions that the investment is intended to serve military rather than shipping objectives. Amit Bhandari is Fellow, Energy and Environment Studies, Gateway House. Aashna Agarwal is Content Coordinator, Gateway House. This article and infographic was exclusively written for Gateway House: Indian Council on Global Relations. You can read more exclusive features here. For interview requests with the authors, or for permission to republish, please contact outreach@gatewayhouse.in or 022 22023371.